Note 1: This match was rescheduled to 10am in anticipation of heatwave conditions. U dont sleep mack... Do u! Wanderers' captain Sarah Walsh has put out the call. It's the last game of the season. Let's do this! Rumour is this game is now on at 10am to avoid the heat. Can anyone confirm? @swalshy9: â€œ@hyproaust: @swalshy9 any word if the weather might cause the game this week will be delayed? !â€ Game v Sydney on Saturday is now at 10am! Apparently this match has been rescheduled for 10am. Will wait for more confirmation though. if you change the drop down day to Saturday and click 11am it forecasts 35deg at 11am at campbelltown and getting hotter. ouch. before a max of 37deg for the day. will still be there tho to see us keep sydney fc out of the finals, still something to play for at least! IMPORTANT UPDATE | this Saturday's W-League and National Youth League games v Sydney FC have been rescheduled due to extreme heat conditions. Westfield W-League at Campbelltown will now kick off at 10am AEDT and the Youth League at Manly is also 10am AEDT. Got no sleep, hot and annoying mozzie flying around my head all night and sucking my blood, got hold of it and squashed my hand but it flew out like an indestructible cockroach. Not going to have much energy for the game so will have to break my rule of not drinking any Mother on weekends to stay awake. I've been practising chants all week so I ain't missing this one. It as unlucky for the loss but from what ive heard through the grape vine, the ESFC supporters were spewing at the RBB support at the game. Way to stick it to em' guys! 1) You gave the girls the best match-day experience that any of them have ever experienced in this country. I spoke to many of them after the game and they were stunned, amazed, encouraged, thankful and excited. None said that they cared about the result on the pitch - all they talked about was the result in the stands. 2) You set the bar for support at a W-League game and set it bloody high. The interwebs are ablaze with commentary. Supporters AND players of other clubs are almost speechless at the turnup and passion on show and are wondering if they can possibly ever match it. The only criticisms I heard were about the flares & the "eff off" chant. Personally I don't think the W-League is ready for that yet. Oh, I took some photos too. Thanks so much for the feedback and the photos! Man, makes me get the warm n fuzzy's knowing the girls enjoyed it as much as we did! Really reminds us how much of an impact positive support can have - i wonder if we should make the W-League support a regular event? We already know how much the girls would/do appreciate it, and if other clubs are wondering if they can ever match it, i reckon we need to push it to another level - double the support and keep them following our lead!! And i may have been daydreaming, but i honestly dont recall any F-off chants... Anyone else? What a shame this was rescheduled to 10am. A lot of people would have made the afternoon kickoff. More commitments in the morning. Glad to hear the girls had a blast. 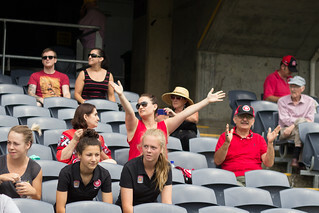 By the sounds of it our supporters had a blast too and will probably end up going to more W league matches in the future to support the girls in red and black. Would be great if some future games next year were played before the main game if something could be arranged. Nonetheless, great photos. All around top effort. Would be great if some future games next year were played before the main game if something could be arranged. Nonetheless, great photos. All around top effort. yeah i was thinking about this idea. but then again thats another 90mins before the main game where we will be chanting and going hard out. we will be buggered by the time the mens kick off. i rekon a better idea would be, say if the men play on sunday away. schedule the womans and youth team double header on the saturday. Those flickr photos are amazing! They've certainly captured the atmosphere and the emotion from yesterday. I loved the one where Walsh brought the baby over to the RBB for some snapshots, and the baby can't take her eyes off the RBB. A future Wanderer right there! http://www.flickr.com/photos/efcso1/8374324490/in/photostream/ was a great shot! Might be talking about the F&*# Sydney FC ole ole ole, ole ole ole, ole ole ole. Only went for a short time but there was no eff off chant. I think it was the "Let's go f***ing mental!" chant after the goals. But congrats on the great atmosphere and noise created by all those behind the goal! here is some mobile phone footage from behind the RBB when the 'who do we sing for' chant was going stand to stand. Also shows the direct pen. Wow. Just wow. The girls are still flying a mile high. Most of them have been to Wanderland and had loved the match day experience there. Now they've experienced it aimed at them and they would love more. I've been to all of their home games, plus a couple of away ones, and none have come close. The largest W-League crowd I've seen was in Canberra, who had 700 to the game against our girls last week, but they weren't a pinch on Saturday's epic. I did get one photo of the grandstand that highlights how the rest of the Wanderers Family felt. This is Servet Uzunlar's mum, sister & dad sitting just behind our non-playing girls for the game (Jenna Kingsley, Candace Sciberras & Georgia Rowntree for those who want to know) and they are joining the "Who do we sing for" chant. First time it's rung out at a W-League game. I dunno about you, but I found it heart-warming. I'm glad you all liked the photos too. It was great to be pitch-side and capture not only the game, but the passion, the excitement and the energy that everyone generated. Honestly, we must make this a regular thing, for several reasons - some of which have already been mentioned. Trying the new chants sounded like it went well, but was also fun as there was plenty of laughter and banter as everything was explained. Obviously the smaller group helped in that and made it easier for the Capos to be heard by all. In addition, my two young blokes Jake & Deebz, went in and lost their RBB cherries. Both were hoarse by the end and, even though they didn't know all the chants, there were a couple of you ratbags who took a few moments to bring them up to speed AND, most importantly, thanked them for joining in for the day. They had a ball. The only sour note was Jake getting some kind of flare striking him in the back of the leg and giving him a bit of a burn - and the smoke didn't help his asthma much either - but he took it for the team and I'm sure the hair will grow back eventually. To be honest, if we could get a regular squad of even 20-30 at each game, you can make enough noise to be heard everywhere. With a bit of planning, we can cover every contingency for getting there too. Deebz and I both have bus licences and, if we're going to do it properly, are prepared to arrange a 22-seater and drive it to-and-from the home games (especially if there's trackwork etc), derbies against ESFC and possibly we could even do the away games in Newcastle & Canberra. Keep it in mind. 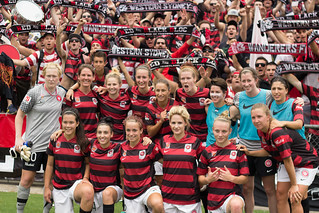 The RBB - and the Wanderers - have set a new benchmark for the support of Women's football. Next year, let's challenge ourselves to do even better. We have a very talented squad and, if we can keep the core of the team together, next year will be a finals year for sure. Stephen Roche, the Manager, knows his stuff and has managed to emulate many of Popa's feats with the team. From the bottom of my cold, black heart, THANK YOU ALL for the day. As you might suspect, I've got a reasonably close relationship with many of the squad. They had, especially early in the season, been feeling a bit orphaned. There wasn't a lot of media or hoopla made about them and that hurt a little. That has now changed. To a woman, they now know that they're as important a part of the Wanderers Family as the big boys - largely because they felt the love of the RBB. We finished 6th our of 8 teams - a brilliant result in its own right - and almost made the 4-team finals series. It's a mirror image of the A-League men - a quickly-assembled team, unfancied to do much, punched well above its weight. And the girls did it with bugger-all budget,all of them either working or studying full-time, and with (mostly) part-time or volunteer coaching & support staff. Let's make next season the one where the RBB, the Wanderers Family and our fighting W-League "Walshy's WanderWomen" make an indelible mark on football. great post mate (minus the bit about a flare burning the back of your boys leg ). i could tell the girls appreciated the support, and i'm sure it is something that we can plan to do more of next season. thanks for all the photos as well. great job this season ! That's great to hear efcso. TBH we should be using W-League and NYL games as practice sessions for the A League with regards to new chants and stuff. I can understand how your kids would've lost their voice and that, being their first time, but for most of us, it was much more chilled and I personally only took a couple of hours (and a $1 slurpee from the local hungry jacks) to get my voice back because of the relaxed nature (as opposed to 3-5 days for an A League match). Given that it's free entry I'd gladly make the trip, at least to campbelltown if not further, for more matches. Spec - 2 slurpee's please. 1 coke, 1 rasberry. HJ Girl - i'm sorry. we don't have any slurpee's atm. Spec - oh ok. 1 ice cream, 1 milk shake. gets to window - 1 slurpee. 1 milk shake. Did JAR flash his RBB scarf to get some rep points with the HJ chick?